TIM Ltd. established in 1993, as the first private factory to produce ladies pantyhose in Bulgaria. Nowadays, TIM tights company is located in Borovo - Ruse region in Bulgaria, in a privately owned property and (occupies) 40 people. With our 15 years of experience we are continuing to meet the requirements of the Bulgarian and European woman. TIM manufactures knee-high stockings, thigh-hi stockings, footsies, hold-ups, long stockings, ankle high stockings, bodystockings, footless tights and leggings for both children and women as well as plus size hosiery. The range of products stretches from 15 den to 90 den. The company uses many different yarns and fibers in its products to achieve different effects. Furthermore, TIM has already paid particular attention to its packaging, by introducing photos to enhance the stores' shelves and to simultaneously point out the usage and the final result of its tights. The artistic look of each package distinguish us from the others, making us memorizing and unique. The company has its own design team to create the looks of the collections - from the product design to the package. The photographers and our models are giving the collections the artistic outside the ordinary look. The web designers make sure you are always up to date with the latest news and events. New technologies are giving us the opportunity to be dynamic and precise in the design of our fashion collections, provoked by the worlds fashion tendencies. TIM keeps renovating and conserving its quality by following at the same time the variety and the trends of fashion. The company is in good relationships and cooperation with other leading manufacturers in Bulgaria. You can fill our Feedback / Contact Form. To give the motive and the chance to the woman to love her legs and to show them off, full of proud and self-confidence! To make the woman to feel that by wearing tights she takes care of her legs, because wearing tights means caress and soft touch! To teach the woman the pleasure of being self - complacent! To get the woman in touch with the delight of being touched with sensitivity and caress, and all these just by wearing tights! Our vision is to make each woman come in contact with her legs and in this way give her pleasure and satisfaction! To make the brand easy to find and make woman sure that the product inside is the same every time, no matter where it is bought from. TIM Ltd. is established in 1993, as the first private factory to produce ladies pantyhose in Bulgaria. In 1994 the company launches its first collection of classic stockings and tights. At first all of its production is sold on the Bulgarian market. As the company grows, it started expanding its markets. In 2004 the company introduces its revolutionary new collection of fine products with fashion pattern and variety of color combinations as The Luxury collection. In the same year TIM launches its website www.tim.panayotov.com . In September 2005 the company was presented on the MODEXPO Exhibition in Bucharest , Romania with his new collection of pattern fashion tights. By the year 2006 TIM Bulgaria is on the European market and some other countries in the Pacific and North America. As Bulgaria enters the European Union on 1st of January, the company is looking to expand on more markets and the first country will be Romania. The flexibility and quality are leading the company to a growth through the years. We work with knitting machines mainly from the most reliable producer in the branch - Lonati S.P.A. Italy. closing we use machinery by Matec S.P.A Italy - Solis automat. And to make the products even more smoother and a real fine piece of workmanship the Lonati machines are equipped with elastane feeders by Memminger-iro. The company is installed on a privately-owned industrial space. for the products exist also in various stages of production. The offices of the company are located in the same space in a friendly and familiar environment. All of the products we produce are made in our own factories in Bulgaria. We also issue EUR.1 certificate to state that our products are manufactured in Bulgaria. 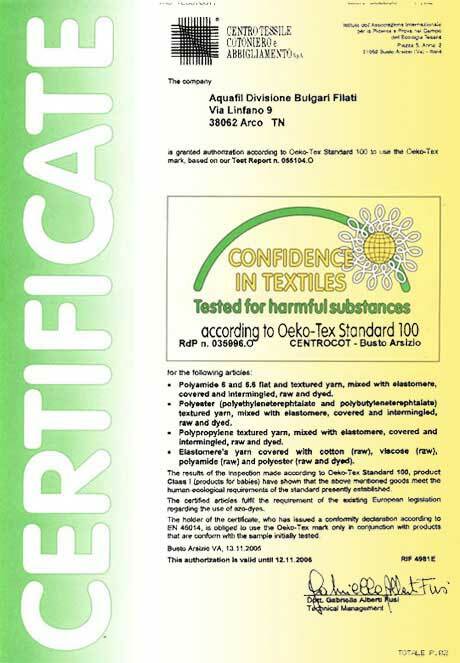 All yarns we work with are tested for harmful substances and have a Oeko-Tex 100 certificate.